This week the April Alpha Pole Challenge is wrapping up as the month of April comes to an end. This month my pole progress has been touch and go. I started out strong as the month began and throughout the last couple of weeks I've barely had time to touch my pole. The weather has been getting warmer which has brought me outdoors to work on our courtyard garden. I live inner city and have been learning all about the trials and tribulations of being a homeowner with very limited outdoor areas. Last year we decided to grow some grass in our courtyard and do some hardscaping along our very small space. Unfortunately, three of our azaleas we planted did not take and I decided to redo the entire area where they were planted. This year's project includes pots, statues, fountains, and new patio furniture. I've decided to do a complete overhaul of our outdoor living space and making it a serene getaway. The hardest challenge I've found myself tackling has been creating a water feature and making use of an area that is completely shaded and lacks the ground soil to nurture the growth of plants. Anyway, enough about landscaping- I can write an entirely different blog about that as a lifestyle feature piece in the future once everything is complete. On to the pole challenge progress! 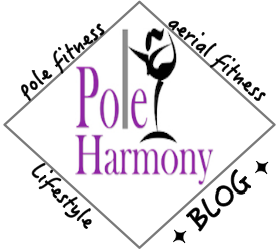 This week I have posted my challenge contributions to my Pole Harmony Instagram. I will be uploading videos for my final letters V, W, X, and Z. U and Y will be a picture posted. Below are the moves I've chosen and my quick recap of challenges I've observed. U: Unicorn. I found this one on IG (Instagram) when searching for a move that began with U. As the everyone has been posting their challenge entries, I've also noticed this one to be called the Stargazer. I like Unicorn as a better term for this move. V: Vortex. I realized when reviewing my video I was initially going to submit that this move didn't quite look right. My arm placement was incorrect and as I'm writing this, I am planning to redo this one and will be posting my entry late. W: Wrist Seat Spin. I LOVE this spin and really enjoyed teaching this one to my students when I owned my studio. It was always a class favorite. X: X climb. Such a tricky way to climb because of that back foot needing to be pointed. This has always been a pet peeve of mine and something I strive to always achieve in my climbing technique. It just cleans everything up and makes use of those leg muscles in the process. Y: Yogini. Wow. It's been awhile since this one has been attempted and I found myself struggling to maintain a hold. Z: Z-Spin. I struggled with this letter. I found a spin on IG that I attempted to replicate and instead came up with my own variation after many trial and error attempts. This one is a lot of fun once you figure out the proper positioning for each leg and arm. Thank you to Instagram user Tropical Vertical for coming up with this amazing and fun monthly challenge! I really enjoyed participating and seeing what everyone else was posting. To check out all the entries, be sure to use the hashtag #aprilalphapole.